Prelude: After treating most of the Transformers as disposable CGI cannon fodder in the first three live-action movies, Age of Extinction went the next logical step and showed us humans building their own disposable CGI cannon fodder Transformers. One of them (or several of them?) was Stinger, modelled after Bumblebee, but “better in every way” according to the ad. Yes, they also had ads for their disposable CGI cannon fodder Transformers. Anyway, Stinger didn’t really do much in the movie except show off the awesome laziness of the movie’s animators by changing shape in a cloud of pixels instead of properly transforming. So if you don’t remember (or wish to remember) the movie character Stinger, that’s entirely understandable. But the toy Stinger is another matter entirely. Robot Mode: It’s hard to come up with something new regarding a robot that becomes a car. 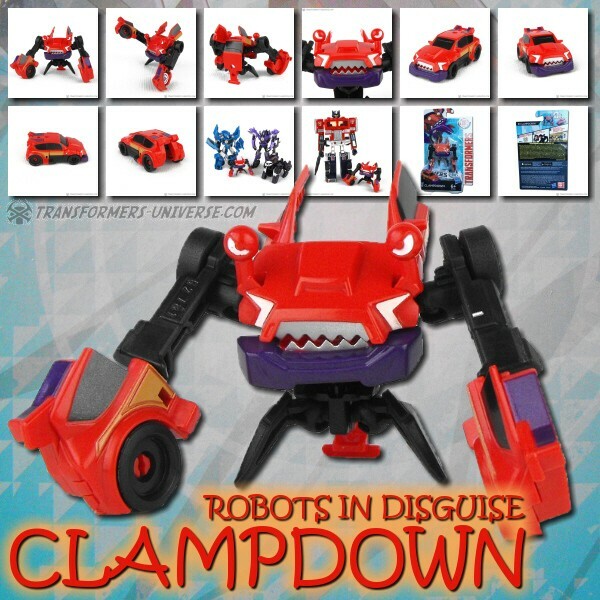 You have the classic Hood-as-Chest version, the equally numerous Roof-as-Chest version, plus several variations of robots basically carrying the car shell on their back. Every now and then, though, you get some new ideas. The 2001 RID series showed us quite a few, Prime’s Vehicons did a great job, and now there is Stinger. A robot that at first glance shows almost no signs of becoming a car. It’s hard to describe how exactly Stinger’s robot mode emerges from his car mode. The body of the car basically turns inside out and twists around. There are two wheels inside his chest, the windshield becomes part of his torso, the only “classic” thing about the design is that the car doors are on his arms. Stinger has one of the most intricate and original transformation schemes I have seen in a good long while and he pulls it off fantastically. The resulting robot not only looks great, he is very nicely articulated, too. For his main weapon he carries a “stinger” on his right arm, really part of the roof folded together. Additionally he has four spiked discs that he can display on a four-armed holder emerging from his back or attach to his forearms. Just about the only slight downside here is that the chest area of the robot doesn’t click firmly together, but rather the head and neck area just fold down onto it. Would have liked a more solid connection here. Apart from that, though, a brilliant robot mode. Very original, cool looking, no real flaws. Alternate Mode: Stinger transforms into a red and black Pagani Huayra sports car. Now apparently a number of Stingers are missing the rather prominent side mirrors in car mode, so keep an eye out for that when buying this guy (they sit on the back of his shoulders in robot mode). Anyway, after the very complex yet still intuitive transformation (21 steps according to the instruction sheet), you get a very cool-looking car with no trace of the robot mode to be seen. Not even a visible head on the underside. Stinger’s discs can be stored on the underside, but unless you put them in one hundred percent correctly they drag on the ground. So bottom line: a very nice car mode. No complaints. Remarks: How times change. I still remember when red Bumblebees were called Cliffjumper most of the time. Even in the first Movie line we had a red Bumblebee repaint called Cliffjumper. But things change and now we have Stinger, who is a red Bumblebee only in the sense that the movie he (briefly) appeared in said that he was modelled after Bee. In the movie that led to him being brutally impaled and blown apart by that friendly and cuddly kid-appeal character Bumblebeee, but for the Studio Series it means he gets a figure all his own. And a pretty brilliant figure, too, easily beating out the Bumblebee figures we’ve seen in the Studio Series so far. Bottom line: while holding absolutely no character-value, Stinger is a great toy, one of the most original car-formers in a long while. Recommended to everyone who isn’t utterly opposed to the Movie-style of figures.